"You are a woman, and you may be pretty, but I will not trust you!" When Chinese actor Jackie Chan first rose into Western fame in a big way (right about when Rumble in the Bronx hit theaters), a number of oddities from his career were released to quickly cash-in on his newfound popularity. Of course, people found out the hard way that many of these older Chan flicks were not only mediocre at best, but weren't even martial arts/action films. Some of them didn't even star Chan; his image was only used on the cover in a dubious tactic to trick viewers. His 1978 film, Snake & Crane Arts of Shaolin is one of those films to suddenly appear out of nowhere on video store shelves and, as his early films go, it is easily the best you'll find in the mainstream marketplace. Snake & Crane actually is important, as it is the first film in which Chan was really able to spread his wings as a fight choreographer and to be more personally involved with his projects. Manykung-fu films from this period are weak in terms of action and story, but this one shows the origins of Chan's signature intensity and love of wild stunts. The premise is that, in ancient times, a group of kung-fu masters got together to create asuper technique that combined all the positive aspects from the great masters, and wrotethem in a book. The end result was the "Snake and Crane" style, which was supposedlyunbeatable. As the film kicks in, we find that Hsu Yiu Fong (Jackie Chan), a simplewarrior, is in possession of the book and knows the technique, thus making him extremelypowerful. The problem is, when he arrives in a small village, he foolishly and smuglybehaves like the master of this ancient style, so now every warrior in the provinceknows he's got the legendary book, and they want it. Every clan in the region, from the Black Dragons to the Wu-Tang comes after him, offering either a deal or certain death. The end result is a micron-thin plot that literally serves only to provide a kung-fu battle every couple of minutes. Now, Chinese martial arts films from the 1970s can't really compare with where the genre went in the 80s and 90s. They're nowhere near as intense or complex, but they are still entertaining. Unfortunately, even with Jackie Chan in the mix, the pace of the action sequences still has that slow, deliberate pacing charactaristic of that era. A few of the fights are, I'm sorry to say, almost embarrassingly weak, because the cast members really don't have the same talent as Chan. Rest assured, the important fights are a lot of fun, but many of the minor ones are simply passable filler. Chan, as a character, is in an interesting place here, since he's not really a good guy or a bad guy. He's somewhere in-between, and even though his trademark slapstick humor isn't particularly present, there is an element of fun here that should be familiar to anyone experienced with Chinese cinema. The jokes are flat and terrible when taken in a strictly Western context, but things like women dressing up like men and such are a common element in these period pieces. Of course, there's unintentional humor from some of the poor editing and bad foley; this is a classic example of the "meat-pounding" syndrome where the same 'punch' sound effect is endlessly looped. Another moment of unintentional laughter comes from the opening credits in which Chan performs a number of exhibitionist, plot-less fights. There's nothing wrong with that, but the musical score is the same, dark, generic music from the opening credits of Monty Python and The Holy Grail! There's little to complain about here. Snake & Crane Arts is a satisfying kung-fu adventure from a good grouping of talent, including producer Lo Wei, the man who made Bruce Lee into a star. Those who are fans of Jackie Chan's period work (stuff like Project A and Drunken Master) should enjoy it, even though it is nowhere near as manic and action-packed. It's also never boring; it's almost constant action, almost laughably so. Every person that shows up typically winds up in a brawl of some sort, but that's what we want, right? Image Transfer Review: Luckily, Snake — Crane Arts of Shaolin is widescreened, restoring it's 2:35:1composition for probably the first time since it was in theaters. The image is heavily damaged, there's no covering that up, but despite that, provides a pleasing and surprisingly high-quality anamorphic image. The colors are presented well and despite some heavy grain here and there, the image suffers no compression issues. Other than the souce print's damage flaws (numerous scratches, lines down the frame, holes, etc. ), the film is amazingly presented here; far above anything I would have ever expected from a film so old and, presumably, uncared for. Audio Transfer Review: In a great gift to us all, the original Chinese audio track—a Mandarin dub—is presented, allowing viewers to enjoy the film without the awkward English dub (unless you want to), making it far less laughable and distracting. Neither track is particularly great; the Englishone has better dialogue, while the Chinese is a bit muffled and damaged. The limitations of the source are obvious, but expected. For all the limited frequency range and occasional harshness, its basically acceptable and gets the job done. Extras Review: Other than some trailers, there are no additional features. The 28 chapter stops offer a good division of the film, so there are no complaints there. The presentation is minimal, but thankfully, not misleading. 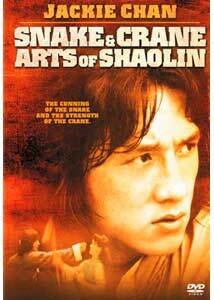 Snake & Crane Arts of Shaolin is well worth a look by the Jackie Chan or basicmartial arts fan. It's a little silly and nowhere near as technically brilliant as Chan's laterwork, but it's a solid kung-fu period piece. The fact it's widescreened and uncut makes ita nice, unchanged piece of martial arts film history.